Day 22: What is your favorite recipe? I love Kale Lasagna. I found this recipe when I was attempting to the South Beach Diet. (It was an epic fail, by the way). I like making it when we have friends over, and it’s one of Brighton’s favorites now. DISCLAIMER: This is not my recipe, this was adapted from Kalyn’s Kitchen. She has some great low-carb recipes! *I usually switch the sausage out for ground beef or turkey. **I use the Classico Spicy Tomato and Basil sauce. It adds a good flavor to the dish too. While the kale is cooking, heat the oil in a large heavy frying pan, squeeze sausage out of the casings, and saute until the sausage is cooked through and nicely browned, breaking it apart with the turner as it cooks. When the sausage is done, add the pasta sauce, dried basil, and ground fennel. Stir to combine and let the sauce simmer 20-25 minutes, or until it’s thickened and the liquid is reduced. 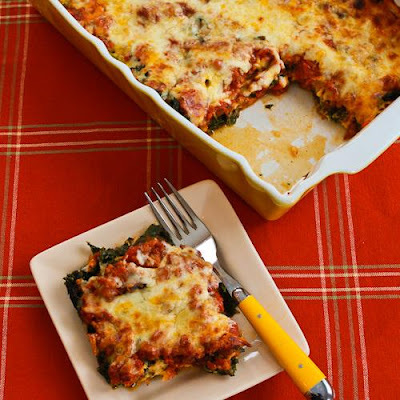 In the casserole dish, layer 1/2 the drained kale, sprinkle 2 T Parmesan, 1/2 the sauce, and 1 cup mozzarella. Repeat with another layer of kale, Parmesan, sauce, and mozzarella. Cover the dish with foil and bake for 20-25 minutes, then remove the foil and bake another 15-20 minutes, or until the casserole is bubbling and cheese is starting to brown.